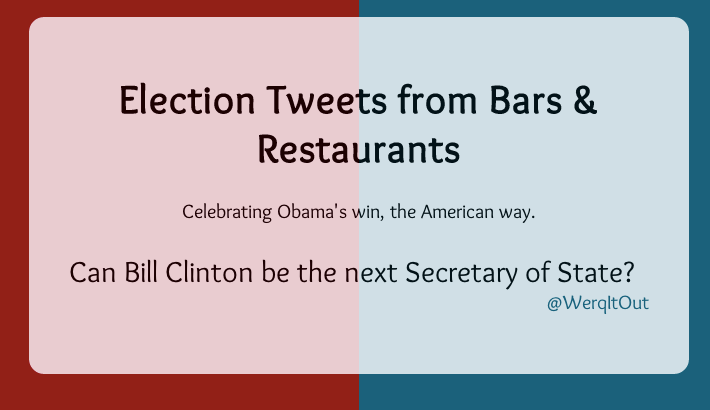 Students in the Twitter class were challenged yesterday to write some code in class to do something interesting with election day tweets. One group leveraged the code they are developing for their final project to quickly build an app that what people are saying about the election who are near (or claim to be near) Berkeley restaurants. Now it is changed to people contemplating or celebrating the results. Congratulations to the Berkeley Restaurants Team!